Mazaya is a Complete Blogger theme for a news or magazine site with the focus of attracting and keeping visitors on their site. Mazaya is a elegant and professional news theme which is great for anyone looking to display a lot of content in a clean and user friendly manner. Mazaya focuses your images, pictures including video files and allow them a better exposure for your fans and audience so that they can get engaged with your blog's content. Practically every typographic element has been endlessly tweaked for different screen sizes to make sure it looks great no matter what the device. 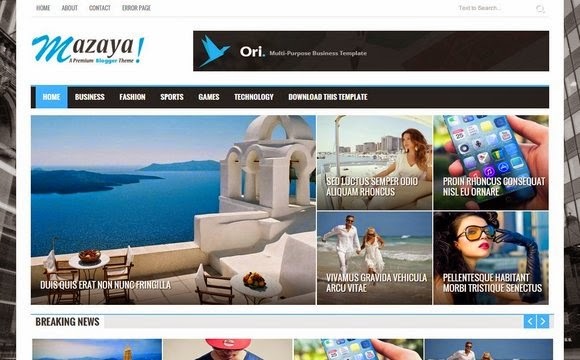 In Mazaya Blogger Template You will love the smooth and fast user experience. This theme is perfect for Search Engine Optimization, Plus Personal Blog, Lifestyle, OOTD (Outfit Of The Day), Fashion and News Blog.